There is, for photographers, one way to maximize your time touring through other people’s towns, and that’s the time-honored tradition of “riding shotgun”. Drive me anywhere, but give me a window seat. I wasn’t trying to go for some kind of personal best in the area of urban side shots in 2013, but by good fortune I did snag a few surprises as I was ferried through various towns, along with a “reject” pile about a mile high. Like any other kind of shooting, the yield in window shooting is very low in terms of “killers per click”, but when you hit the target, you crack through a kind of “I’m new in town” barrier and take home a bit of the street for your own. Business has been really dead lately. 1/250 sec., f/5.6, ISO 100, 35mm. This guy just killed me (excuse the expression). He seemed like he was literally waiting for business to drop in (or drop dead), and meanwhile was taking in the view. 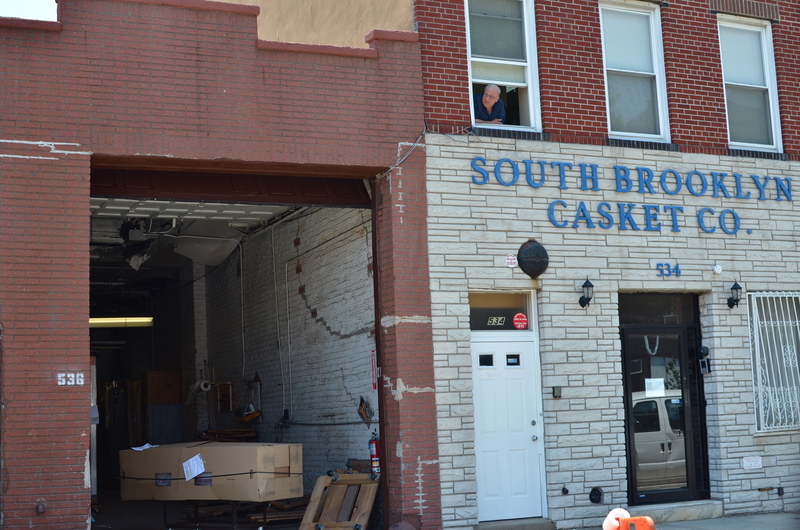 Probably he didn’t even work for the casket company, in which case, what a bummer of neighbor to pick. Maybe he’s rent controlled. Franklin Park Conservatory, Columbus, Ohio. 1/40 sec., f/1.8, ISO 500, 35mm. This one took a little tweaking. 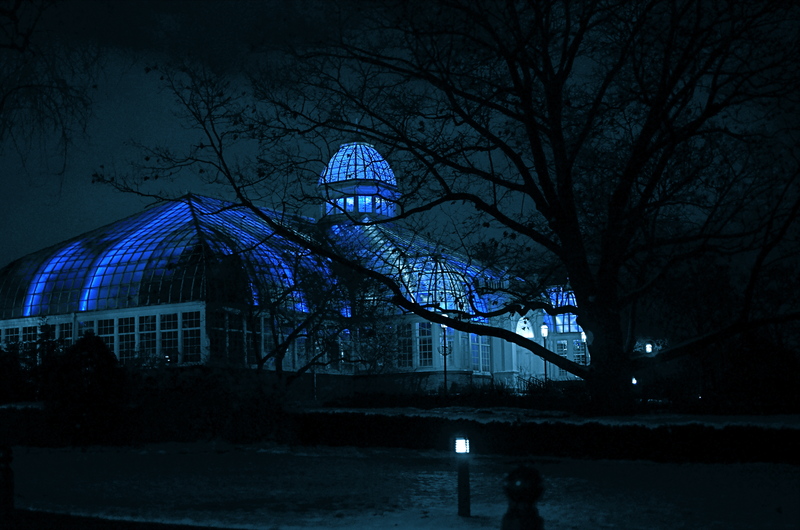 The building was actually blue, as you see here, lit with subdued mood for the holidays. However, in lightening this very dark shot, the sky registered as a muddy brown, so I made a dupe, desaturated everything except the conservatory, then added tint back in to make the surrounding park area match the building. All rescued from an “all or nothing” shot. I’m also ashamed to admit that I bagged a few through-the-window shots while actually driving the car, all done at red lights and so not recommended. Don’t do as I do, do as I……oh, you know. Here’s to long shots, at horse tracks or in viewfinders, and the few that finish in the money. This entry was posted on December 18, 2013 by Michael Perkins. It was filed under 35mm, Available Light, Composition, darkness, Exposure, Framing, Neighborhoods and was tagged with Composition, f/1.8, Hand-Held, low light, Street Photography. performed an impressive job and our whole neighborhood shall be thankful to you. Wow, what a great compliment. If you get some time, write back and give me some background on your group’s project. I’m very grateful if THE NORMAL EYE sparked thought and conversation for your work.